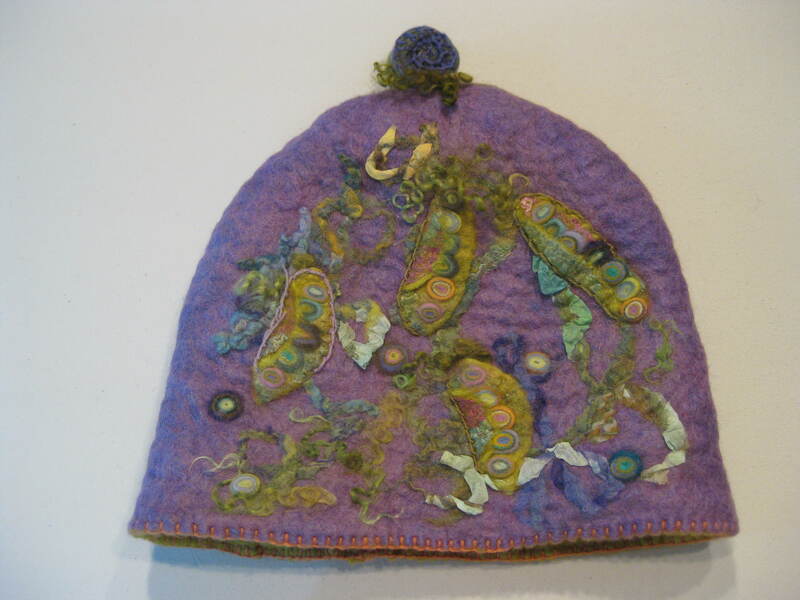 Made of yak, camel, alpaca, silk, merino; decorated with my hand-spun yarn; vintage button closure. Useful for safe-keeping of amulets, antidotes, business/credit cards, feathers, poems. 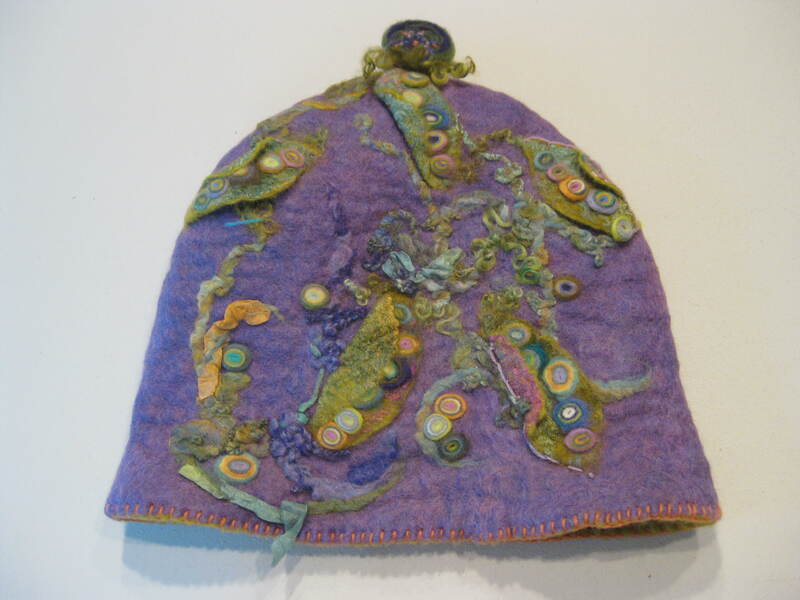 Would you like to learn how to craft a felted prayer or meditation shawl? 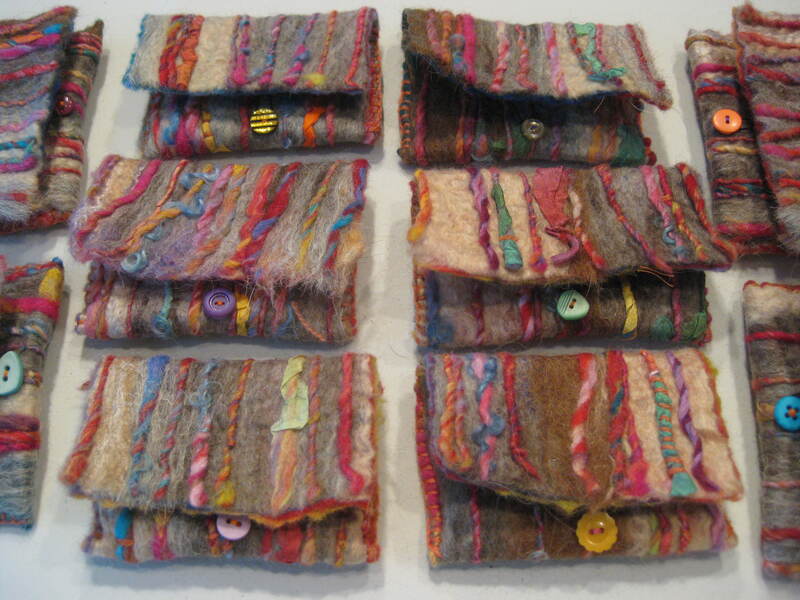 For beginners, this could be an intro to the craft of felting. This central idea is to create a kind of talisman that can be worn as a wrap, a sort of hug that enhances well-being or offers the wearer a helpful reminder. It might express a deeply spiritual/healing vibe, or hold a simple message. It might be something given to a loved one as a way to offer support, or meant as an affirmation. The process, as well as the product, would have healing intention. 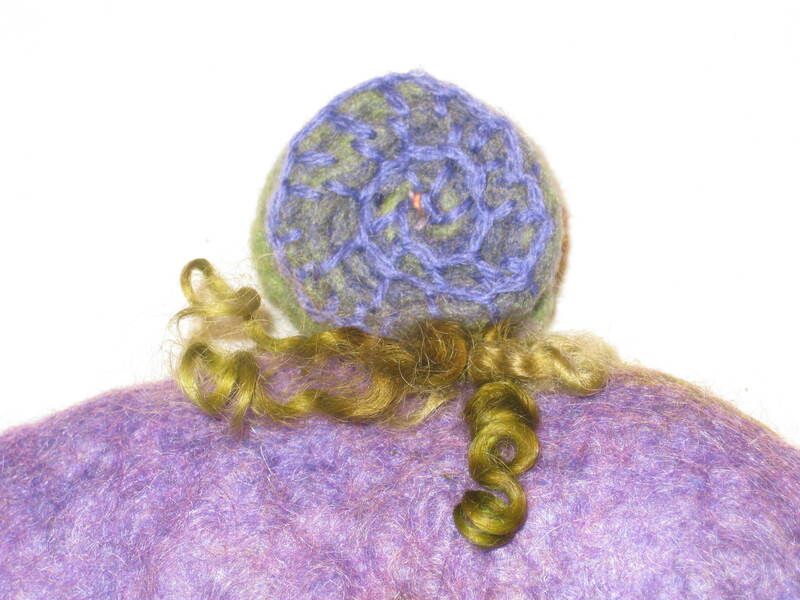 Please send me a facebook message to get on a “Felted Hug” mailing list. This scarf is from my own collection. Sometimes I keep things I’ve created because I just love how they came out and can’t part with them. Sometimes a piece takes such a long time that I cannot figure out what to charge for it, so I keep it or give it away. Other times I am not quite sure if I can replicate how a piece has turned out, or I want it as a reference. I made this scarf so long ago that I can’t remember why I kept it or why I never made any more like it, but later in March I hope to try to make more — with an added dimension to the theme of “Calligraphy” — the calligraphy will be thematic, an interpretation of an image, word or idea. Recently, working on the felted yardage for the card series titled “Home,” I discovered that by using a sushi mat to roll wisps of black merino fiber to form dense pencil-like shapes, and then slicing and pulling apart these “pencils,” I could prepare the fiber to recreate an ink-and-brush line design. It takes a long time. It’s largely uncontrollable. And that’s OK… I like the slowness and the surprises. I only hope that I am not inadvertently spelling out something that’s not nice. When I worked on the “Home” cards, I wondered over and over if perhaps my efforts at rendering the Chinese character for “Home” might read “Messy House.” Seemed only fair. I have worn this scarf a lot. 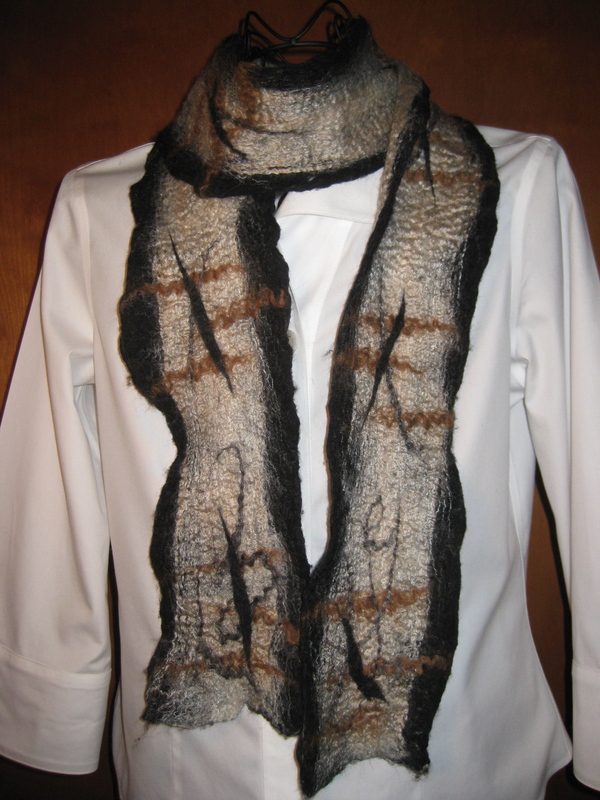 It has a bottom layer of pure honey-colored tussah silk; a mid-layer of black merino wool; and a top layer of more of that honey tussah silk embellished with a design using some alpaca and merino and silk fibers. I’m looking forward to playing with this design, to researching some Chinese, Japanese, Hebrew and other calligraphic forms, and synthesizing fiber and thought. If my muse is kind, by early April I’ll have delivered some scarves to the three shops (The Gallery Shop in Lemont, PA; Contempo Artisan Boutique in Boalsburg, PA; and The Green Drake Gallery & Art Center in Millheim, PA) that have patiently waited for my new work.